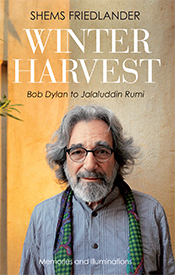 "Winter Harvest" is the long-awaited sequel to Shems Friedlander's "When You Hear Hoofbeats Think of a Zebra," now considered a Sufi classic. Friedlander has spent over 40 years in a Sufi order and is now sharing his stories and travels in the winter of his life. Shems Friedlander is the author of nine books. He is a painter, photographer, designer, filmmaker, and educator. After 20 years as Professor of Practice, he is currently Professor Emeritus at the American University in Cairo. He was selected in 2012, 2013, and 2014 as one of the 500 Most Influential Muslims in the World, in the field of art and culture, by the Royal Islamic Strategic Studies Center.